The Yost 15000 Series bar clamp set is a set of 2 each of the following sizes: 6", 12", 18", 24", 36". the Yost 15000 Series of clamps are designed for heavy duty clamping. The jaws can exert 330 lbs. Of clamping for, 10 percent more than leading brands. View More In Squeeze Action Clamps. 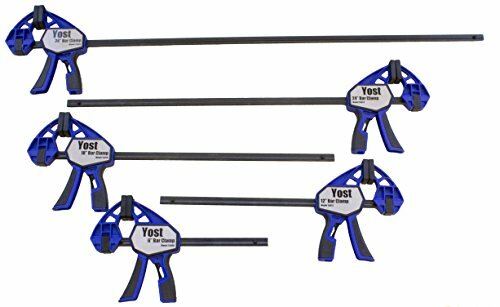 If you have any questions about this product by Yost Tools, contact us by completing and submitting the form below. If you are looking for a specif part number, please include it with your message. WEN 430DPC Drill Press Clamp, 12"